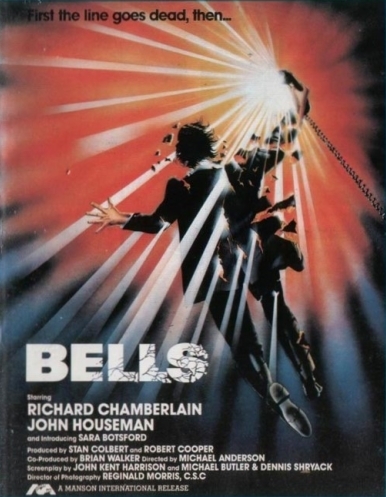 The director of LOGAN’S RUN and ORCA KILLER WHALE made this modest thriller, which opens strong with a scene in which a young woman answers a payphone at a subway station, hears a high pitched sound and then begins to shake uncontrollably and bleed from the eyes. More strange deaths by phone follow, including a moment in which an 80’s kid is too busy doing 80’s stuff to notice that his 80’s mom has been blown to buggery after answering the phone. Authority-challenging professor Richard Chamberlain becomes obsessed with the strange goings on. This might be the only movie in which the hero uses his opinions of Ohm’s Law to seduce the leading lady (Sara Botsford), and it also has a typically crotchety late-period role for John Houseman who, as Chamberlain’s mentor, could curdle a whole city’s milk supply with one disapproving look. Also known as the slasher-sounding MURDER BY PHONE, it riffs on paranoid 70’s cinema and its technophobic undercurrent was timely for a period in which so many horror movie protagonists were terrorised by psycho-killers on the telephone. The unusual denouement – and the spectacular demise of the villain – are well done, with another ingenious uber-villain intent on getting rid of society’s “rubbish”, and Chamberlain is fine as the cynical hero, though it never quite lives up to the very intriguing premise and the cheesy freeze-frame shock ending won’t wash with unforgiving viewers.